WSU pharmacy team members Peter Tang, Frank Nenninger and Chad Schmitt, l-r, prior to presenting their business plan at NCPA in Boston. All are part of the WSU College of Pharmacy and Pharmaceutical Sciences class of 2020 based in Yakima, Washington. 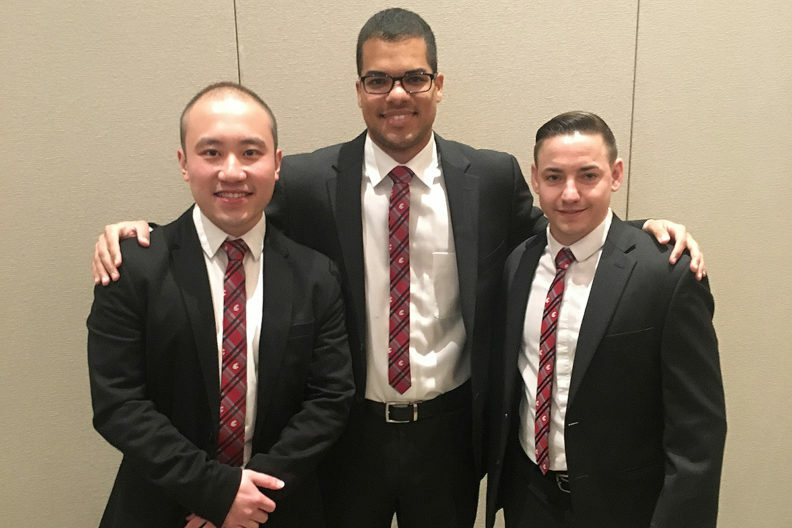 The trio competed at the NCPA Annual Convention in Boston and beat finalist teams from University of Missouri Kansas City and Ohio Northern University. Their first place prize includes $3,000 to WSU’s NCPA student chapter and $3,000 contributed to the school in the dean’s name to promote independent pharmacy. The team’s members, advisor and dean also will receive complimentary registration, travel and lodging to NCPA’s 2019 conference. Their business plan focuses on using both innovative and old‑fashioned strategies to expand access to health services and specialty care in the Yakima Valley. Innovatively, the plan leverages technology to provide patients in rural and underserved areas access to self‑service options online and through a mobile app for custom compounding, diabetes therapy management and education services. They plan to maintain trust and familiarity of their pharmacy name in the community through old‑fashioned customer service and community engagement. This is the third time in the 15‑year history of the competition that WSU has come out on top, taking first place also in 2006 and 2011. Providing these types of opportunities for students to engage with leaders in the profession and gain recognition nationally are examples of how the WSU College of Pharmacy and Pharmaceutical Sciences is dedicated to developing outstanding health care providers through a transformative academic experience. In at least 10 of the last 15 years, a team from WSU has placed in the top 10 or better, nationally. Team faculty advisers were Clinical Assistant Professor Damianne Brand‑Eubanks in Yakima and Vice Dean for External Relations Linda Garrelts MacLean in Spokane.